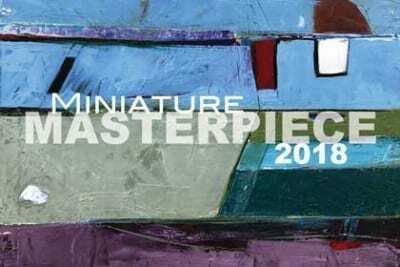 Miniature Masterpieces 2018 is Old Town Artisan Studios first annual art show fundraiser. Celebrate local, regional, and statewide artists who generously donate original artwork in support of Old Town Artisan Studios. This year, Miniature Masterpieces is presented in Leland Gallery at Old town Artisan Studios from November 29th to December 18th, 2018. A variety of paintings, photographs, prints, sculpture, and mixed media works will be on display and for raffle. Visitors have the opportunity to win their favorite pieces by purchasing raffle tickets. Miniature Masterpieces raffle tickets are $5 each, or $30 for seven. Tickets will be available until December 16 at 5:00 pm, with winners announced online by December 18. Old Town Artisan Studios is greatly appreciative of all of the artists participating in Miniature Masterpieces raising funds, allowing OTAS to provide a wealth of classes at affordable costs to people of all ages and to improve the multiple outreach programs OTAS has to offer. Miniature Masterpieces 2018 will exhibit a large variety of paintings, photographs, prints, sculpture, and mixed media works, all on display for raffle. Old Town Artisan Studios is greatly appreciative of the artists and community members for participating in Miniature Masterpieces 2018, which allows OTAS to provide a wealth of classes at affordable costs to people of all ages and to improve the multiple outreach programs OTAS has to offer.. Miniature Masterpieces runs from November 29th through December 18th, 2018. Everyone has the opportunity to win their original Masterpiece artwork by purchasing raffle tickets. Miniature Masterpieces raffle tickets are $5 each, $30 for seven, or $75 for a bundle of 21 tickets. Tickets will be available for purchase from November 29th to December 16th at 5:00 pm. Winners will be announced and contacted on December 18. All Miniature Masterpieces artwork must be dropped off at or mailed to Old Town Artisan Studios. We will not be conducting pre-registrations, submission of artwork will count as your entry into Miniature Masterpieces. The first 130 works of art received from August 21 – November 15, 2018 will be accepted. 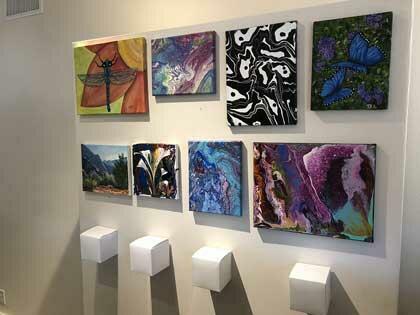 All artwork drop-off must be during Old Town Artisan Studios open hours, Tuesdays through Saturdays 10:00 am – 5:00 pm. Late submissions will not be accepted. Mailed-in Miniature Masterpieces will be accepted but shall follow all guidelines, and will be inventoried the day it is received at Old Town Artisan Studios. Please include all required information in mailed package. OTAS will not be responsible for any artwork that is damaged or does not follow listed Rules of Entry. All subjects and media are accepted. However, OTAS reserves the right to refuse a work of art for any reason. Participants of Miniature Masterpieces must be 18 years of age or older. Only one original Miniature Masterpiece per artist will be accepted. Artwork can be up to but no larger than 7 x 9 inches or 8 x 8 inches in size, including the frame. When choosing a ready-made frame, please measure the outside dimension. Three-dimensional artwork can be up to but no larger than 7 x 7 x 9 inches in size. Art must be ready to display or hang with hook or wire attachments. Eye hooks are not an acceptable hanger. OTAS has up to 72 business hours after artwork drop off to reject the artwork. Please label your artwork on the back or bottom, with your name, title, date, and medium of the piece. Label information will also be collected at the time of drop-off. At the time of drop-off, please note any display instructions intended for your Miniature Masterpiece. If none are given Old Town Artisan Studios will display at their discretion. Upon completion, artwork must be claimed by 5:00 pm on Friday, December 28, 2018. Artwork unclaimed by the winner becomes the property of Old Town Artisan Studios. Disclaimer: By submitting your Miniature Masterpiece, you give Old Town Artisan Studios the rights to use your Miniature Masterpiece in any way for any and all promotional or advertising projects.